Figure 3.9. Sustainable land-use planning and its embracing aspects Source: Reprinted from [15, p. 9], with kind permission from Elsevier Science NL. landscapes; from human uses to places where natural plants and animals can live and survive; and many more" . The phrase "sustainable land-use planning" embraces several aspects, as given in Fig. 3.9. 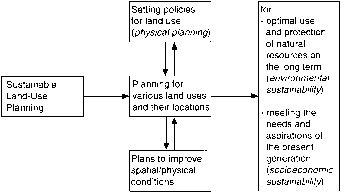 The figure illustrates the two dimensions of both land-use planning (physical planning and improvement plans) and sustainability (environmental and socioeconomic sustainability). Traditionally, both land-use planning and the planning of the rural road network focused on economic and social impacts. The accessibility of the rural area used to be the first consideration. Consequently, existing unpaved roads were paved and existing paved roads were widened or even reconstructed. Furthermore, new paved roads were constructed. In practice, many minor roads were constructed to such a high technical standard that they competed with major roads. This is a follow traffic approach, which is based on road links, not on the whole network. In most industrialized countries, this policy was abandoned during the 1970s. Mainly because of lack of financing, (re)construction of the network of LTRs came to a standstill. In 1986, the OECD  established a policy, primarily designed to conserve the network of high-quality major roads. According to the OECD , the minor road network had become somewhat run down and a sizeable effort in terms of investment and energy would be needed to bring them up to acceptable standards. Furthermore, the OECD stated that design standards were not static but were changing in the light of technological, economic, and social developments. New criteria in geometric design, involving such considerations as energy consumption and side effects of traffic (noise, pollution, unsafety), were being included . The inclusion of new criteria marked a transition to road planning with a wider perspective. It also marked a transition from planning for road links to planning for road networks. So, the question arises as to how such planning can be realized. For this purpose, Jaarsma  suggests a planning system for a network of rural LTRs in three stages. This system is based on existing or planned traffic flows. To obtain a safe and efficient traffic system, first a functional classification of the network should be made. The assignment of functions to the regional road links should be based on an inventory of the present situation (function, traffic volumes and speeds, traffic accidents, acceptable road capacity, geometric features), regional transportation plans, possible changes in land uses, and traffic volumes. A proper distinction between minor roads with mainly a residential access function and minor roads with mainly a traffic flow function should result from this functional classification. For example, five classes of LTRs are distinguished for a densely populated country such as the Netherlands. The main difference in road design is the pavement width, for which 3, 3.5, 4.5, 5.5, and 6 m as standards are advised (Fig. 3.5). The next step in the planning is a mutual harmony among desired function, technical layout, and traffic characteristics, for every road link in the regional network in question. This is schematized in Fig. 3.2. In this second step, the actual technical layout of each road link in the network is compared with its desired layout, concluded from the road function assigned in the first step. Discrepancies, if any, should be removed by introducing the desired technical layout . This may result in a downgrading of some roads. • reduction of traffic and/or adaptation of the traffic characteristics to the road. The first solution is obvious when the desired function of the road is higher than the function belonging to the present layout of the road. In general this means reconstruction of an access road to a road with mainly a traffic function. Widening of roads, construction of bicycle paths, or even construction of new roads are alternatives within this solution (new construction). Unlike the foregoing, the desired function may be lower than the function of the present layout of the road. Then, the second solution comes into the picture. This is also the case when actual traffic characteristics do not match with the traffic characteristics belonging to the desired function of the road. In general, this means refuse admittance to through traffic and/or enforce the desired driving behavior on a road with mainly an access function. There are two ways to realize this solution: structural regulations and incidental regulations. This approach to the problem has a small-scale character. It can be called amelioration . Structural spatial changes to the road network influence rural access definitively, for example by removing a rural road or by transforming a rural road into a bicycle path. These changes can be very effective but they are very interfering for local residents and firms, and so, they should considered carefully. Thus, in practice, spatial changes are difficult to realize . Incidental changes in the network imply either legal regulations (traffic signs) or small-scale adaptations of the roads in the field of traffic engineering. A detailed description of 16 civil technical regulations and five legal regulations, applicable for LTRs, is given by the CROW . The suitability of these incidental regulations depends on the type of problem and the function of the road. This is illustrated in Table 3.6. The functional network approach, as described earlier, differs fundamentally from the traditional follow traffic approach. This holds for both the regional scale and the leading role of the road function, resulting in an adjustment of traffic characteristics instead of the road characteristics in cases where discrepancies appear. It also means that the accepted traffic characteristics are embedded. However, for the road users the differences between the classes may seem too small, and so, they do not sufficiently modify their behavior (traffic characteristics, such as speed). Therefore, a clarification of the functional classification for LTRs for road users (especially car drivers) requires further research. The concept of traffic calming brings new ideas into this discussion. In the functional network approach, the assignment of road functions is implicitly or explicitly based on existing or planned traffic flows. A starting point is a more or less stressed traffic function for each link in the network of LTRs. In built-up areas, this idea was abandoned with the introduction of residential areas. The approach of urban traffic calming started with speed reduction. Urban traffic calming became a wider idea with the Dutch concept woonerf in the 1970s, followed by the German Verkehrsberuhigung in the 1980s . The basic principle is an integration of traffic in residential areas, but based on priority to the needs of people, not the needs of traffic. In the residential space, traffic is unavoidable but it should be subsidiary to other spatial functions. Traffic is concentrated on distributor roads that are able to cope with the flow . This approach represents a fundamental change in rural transportation planning: from following actual traffic flows to regulation of it. Its application creates bridges between contradictory demands for rural road networks. The suitability of this new concept of urban traffic calming as a principle for rural traffic planning is currently under investigation. For this purpose, the concept of a traffic-calmed rural area (TCRA) was established . A starting point in the TCRA is the desired spatial function of the rural area, rather than the existing traffic flows. Aside from the demands of the population, the need for nature conservation also is considered. Principally, in the concept, residence functions (for inhabitants and recreationists as well as for local fauna) refer to the flow function for through traffic. With the modest technical design for this function, roads within the region mainly will have an access function. With a flow function, the region is surrounded by and accessible from rural highways. The underlying idea is a regulation of rural traffic flows with a clear separation of space for living and staying and space for traffic flows. a Road types VI—VIII; see Fig. 3.5 for more details. Pavement widths of types VI, VIT, VII, VIII, and VIIT are 6.0, 5.5, 4.5, 3.5, and 3.0 m respectively. b Only applicable as a component of other regulations. Source: Elaborated from . for example, 60 to 80 kph is planned. Only this second type of LTR is connected with the network of rural highways and trunk roads. This part of the implementation of the TCRA strongly differs from the usual classification as given in Fig. 3.5, with five categories. However, it refers to another recent development, the concept of sustainable safe road traffic [10, 18]. This concept introduces a preventive approach to traffic safety, instead of the traditional curative approach. The reason for this new approach is the decreasing efficiency of the curative approach, especially in most western European countries. The curative approach can be successful as long as a systematic improvement of the so-called "black spots" in the road network is possible. The remaining safety concerns are more complex and more diffuse and are too difficult for the curative approach. 3. an access function on the local level (accessibility of destinations). 3. to promote the predictability of road path and traffic behavior through a maximum standardization of the road design. • standardization of design (as much as possible). Low speeds on LTRs are necessary in the DS concept because of the presence of slow vehicles, traffic flows in two directions, and a mix of light and heavy vehicles on only one lane. For cars, the speed limit is reduced (40 kph e.g., to). The acceptability of the low speeds, from the point of view of the drivers and the perspective of regional accessibility, strongly depends on trip duration on these roads. A maximum trip duration of 3 minutes on roads with this low speed limit has been proposed . Realization of the DS principles strongly depends on the mesh sizes of the regional and local access roads. The larger the area to be opened up with local access roads, the greater the travel time. This demands that small regions be opened up by local access roads. On the other hand, small regions need a high density of roads with a regional access function. This is an expensive solution that requires much space. Therefore, large regions with only access roads on the local level seem to be preferable. However, this leads to another problem. The larger the region with local access roads only, the greater the traffic volumes and the wider the needed roads. For that reason, the current planning distinguishes five categories of LTRs (Fig. 3.5). In other words: the technical layout of LTRs cannot be similar. This conflicts with the DS aim of standardization. As yet, two types of DS LTRs are proposed. For modest traffic volumes (average annual daily traffic [AADT], less then 1,000 motor vehicles per day), a maximum pavement width of 4.5 m is proposed. This type of DS LTR only services local inhabitants and firms. It has an access function only. A second type services local land uses with a higher traffic volume, such as larger villages. For this type a pavement width between 4.2 m and 5.4 m is proposed. To guide the traffic, either median or side lines are painted. Further, because of the higher speed level on this type (60 kph is proposed), a separate path (minimum size 2.25 m) is provided for bicyclists. Only this second type of DS LTR is directly connected with the rural highways. To reduce speed, especially at the intersections, four-way intersections (full crossings) are avoided as much as possible. Miniroundabouts and T-crossings offer a safer solution. To reduce speed, especially at potential conflict points such as exits, the civil technical regulations presented in Table 3.6 may be applied. Figure 3.10 illustrates a possible solution for the functional classification of a rural road network. Within the rural area between the two rural highways, two types of LTRs are distinguishable. To provide for the access to farms and fields, the modest type of DS LTR will satisfy (pavement width 3.5 or 4.5 m; see A-A and B-B in Fig. 3.10). The connection with the rural highways is made by the second type of DS LTR (pavement width 5.4 m; see C-C in Fig. 3.10). Note that direct connections between the modest type of DS LTR and the rural highway are avoided. If necessary for access, a parallel road is applied. Crossings between the DS LTRs are T-crossings wherever possible. Implementation of the DS concept still needs further investigation into the classification of the network of LTRs and the technical design belonging to it. This is also so for the acceptable travel time on roads with low speed limits. The DS concept only considers traffic safety and does not include the other side effects of traffic. Nevertheless, the approach has given new perspectives to the principles of regional road network planning based on regulation of rural traffic flows. Figure 3.10. A possible solution for the functional classification of the road network, within the context of rural traffic calming. Figure 3.11. Sustainable rural traffic planning, step by step . 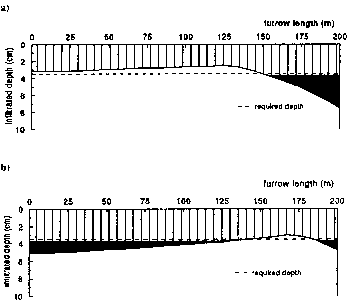 are compared with the flows that are characteristic for the function assigned to that link. 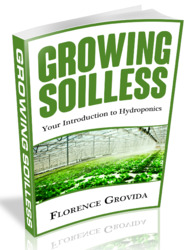 If discrepancies appear, step 6 suggests three different types of solutions. 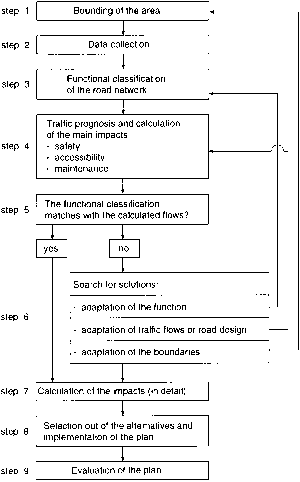 When the road and traffic characteristics from the functional classification match with the calculated flows, impacts can be calculated in more detail (step 7). Step 8 implies a selection from the possible options and implementation of the plan. Step 9, evaluation of the plan, is strongly recommended . • Diffuse volumes at the minor rural roads will be concentrated at a few trunk roads. • Remaining traffic flows at minor rural roads will be rural bound (origin and/or destination along a minor road). • Traffic volumes and speeds within the region will decrease. Case studies [19, 20] show that such a reorganization will counter both traffic safety problems and habitat fragmentation within the region. These cases also illustrate the surplus value of integral planning of rural traffic, based on regulation of traffic flows. Even other impacts of rural traffic may be included in such planning. For example, emissions of exhaust gases, noise levels, or energy use  may be considered. In practice, it may be difficult to realize integral traffic planning. Many rural areas currently do not suffer from the same car-related problems with which urban environments are faced. Therefore, the need for rural traffic planning and traffic management is not widely recognized. There is a feeling that rural areas can continue to absorb large traffic increases . Cullinane et al. report on a Devon County Council and Dartmoor National Park Authority proposal to implement an integrated traffic management scheme at Burrator Reservoir in Dartmoor National Park (Great Britain). This scheme proposes the closing of some roads in the area (either permanently or on summer Sundays only), the running of a frequent minibus service on days when these roads are closed, and the extension of bus services and an existing cycle path. However, criticisms of the scheme, promulgated by a minority of local residents, mushroomed into a major problem. It became obvious that many people had failed to understand the motivation behind the proposals. As a result, the scheme was reluctantly shelved . What are the lessons to be learned from this experience? It is generally accepted that, to be successful, a traffic management plan should be integrated and composed of carrot-and-stick elements . Other studies have highlighted the role of effective marketing. In our opinion, communication with interested parties early in the planning process is very important. These parties must have the opportunity to share their visions on the problems. The next step, finding solutions, should not be started too early because nearly every proposed measure will have some disadvantages for some of the parties involved. Therefore, a complete agreement about the goals of the management scheme and the problems to be tackled should be reached in advance. In a second stage, measures may be developed. Sometimes, even options may be presented. The impacts of the proposed measures can be tested on the basis of the agreements in the first step. This allows for a check of agreements, for example, on reduction of local traffic flows and traffic victims and on a minimum level for local accessibility. The final conclusion is that, throughout the ongoing growth of motorized traffic, there never has been a greater need for the successful implementation of integral rural traffic planning. To realize this, early communication with interested parties and effective communication play major roles. Main difficulties met during the planning process may be of a social, not a technical type.